Our coolest and most coastal of the three Vineyard Designates, this vineyard sits above 1000 feet. 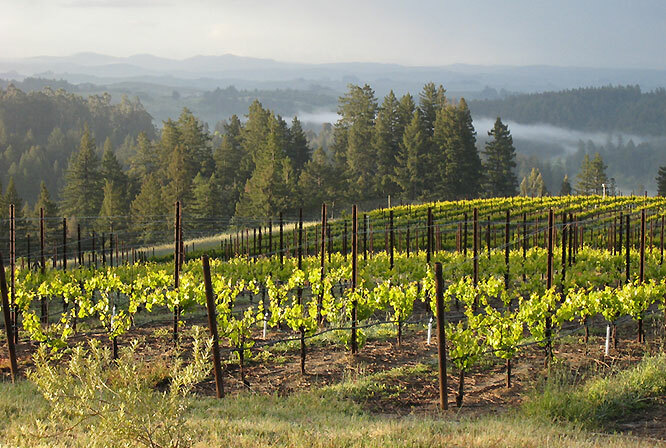 The Horseshoe Bend Vineyard is our coolest and most coastal of the three Vineyard Designates. The vineyard sits at the summit of the ridgeline above the town of Occidental. At this elevation above 1000 feet, even with the cool ocean breezes, the vineyard gathers enough warmth to ripen these tiny Pinot clusters because it sits above the famous fog banks of the Russian River Valley below. Those oceans breezes also add to the flavor packed skins of the grapes by making them slightly thicker to protect against the winds; this character adds a unique structure and texture to the wine and adds a streak of earthiness and darker spices in most vintages. 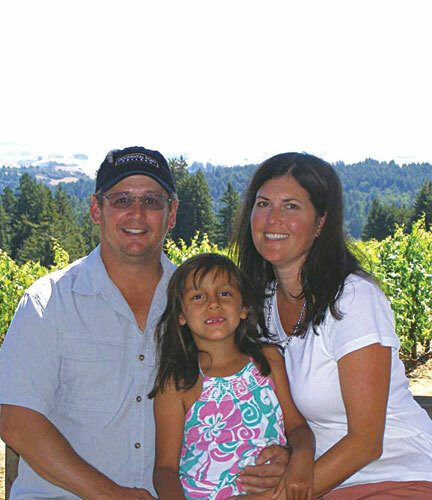 Richard and Joelle Prather are the 4th generation to proudly carry on the family farming tradition on Horseshoe Bend Vineyard. 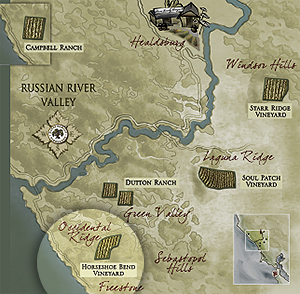 This exquisite Russian River Valley property, originally planted with orchards of apples and cherries, has been in the same family since 1910. The Prathers retain a portion of their estate grown fruit for their own winery, Occidental Road Cellars, while sourcing some of the fruit to a few prominent local wineries. In 1996, the property became known as Horseshoe Bend Vineyard, named after a section of the narrow gauge North Pacific Railroad which passed along the edge of the property in those early days. Today it is planted with 12 acres of premium Chardonnay and Pinot Noir vineyards.